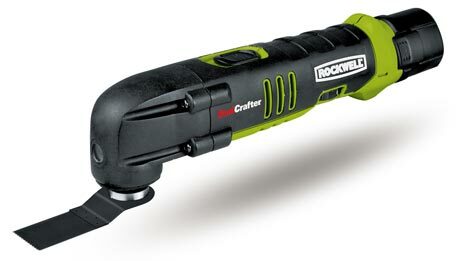 Craftsman has one, Bosch has one, and now Rockwell has announced their own version of the cordless 12 volt oscillation tool. The big advantage that Rockwell has over the other companies, is that they already have a pretty big following with their corded version. This means that you can use most of your corded SoniCrafter attachments with your new cordless SoniCrafter. In fact, I believe the only attachment at this time that will not work with the cordless SoniCrafter is the recently announced SoniShear. The specs for the cordless SoniCrafter are similar its corded brother, using the same 3.2 degree oscillation angle. The difference is that the cordless can run at a slower oscillating speed at the bottom end, 5,000 – 20,000 vs 11,000 – 20,000 for the corded unit. A nice addition is a built in LED light that not only illuminates your cut, but also warns you when you need to recharge your batter by flashing. The tool runs off of a 12 volt lithium-ion battery that can be fully charged in 30 minutes, or reach a 75% charge in 15 minutes. The Rockwell 12V SoniCrafter Model# RK2514K2 is listed at $169.99 and will be available Spring 2010.